Activists demanded city officials take down Burnham Park's Balbo Monument, a gift from fascist dictator Benito Mussolini near Soldier Field. 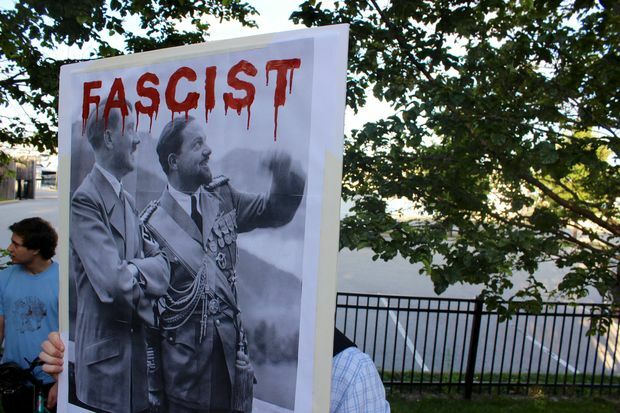 GRANT PARK — Activists demanded city officials take down the controversial Balbo Monument near Soldier Field on Wednesday, calling the gift from dictator Benito Mussolini a "celebration of fascism" they liken to statues of Confederate generals. About 30 protesters gathered Wednesday night near the statue in Burnham Park chanting "No Hate, No KKK, No Fascist USA" and other rallying cries. They were met by a large number of police officers who had taped off the controversial monument in advance. 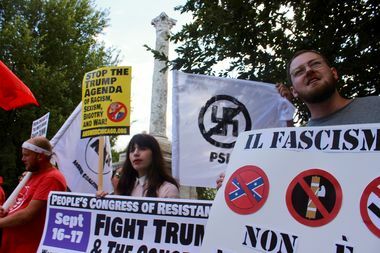 The Balbo Monument "celebrates fascism, and to me, represents the United States has a real systemic problem with white supremacy and racism," organizer John Beacham of the Answer Chicago activist coalition said. "I'll say straight up to Mayor Emanuel 'you need to take this monument down.' There's no excuse." The monument is named after Italo Balbo, a onetime heir apparent to Mussolini and leader of fascist Italy's Air Force. Mussolini gifted the monument, a relic of ancient Rome, to Chicago in 1933 in honor of Balbo's transatlantic flight from Rome to Chicago during the 1933 Century of Progress World's Fair. The monument now sits between Soldier Field and Burnham Harbor at 1400 S. Museum Campus Drive, right next to a similar memorial for Gold Star families who lost loved ones in combat. Wednesday's protest came after a series of protests and counter-protests centered around statues of Confederate generals in the South. A deadly confrontation earlier this month in Charlottesville, Va. drew a tepid response from President Donald Trump that has been widely criticized. Beacham said the recent protests have motivated his movement. "We feel we have to protest, organize and mobilize," he said. Alds. Sophia King (4th) and Brendan Reilly (42nd) announced last week that they seek to remove the Balbo Monument and also rename Balbo Drive, which runs through the heart of Grant Park. Activists on Wednesday said they hope the street will be renamed after Ida B. Wells, a writer and early leader of the Civil Rights Movement who lived and died in Chicago. Beacham said Balbo "is not the only monument that needs to be taken down." He hopes future protests will pressure city officials to help their cause. Susan Gomez, 60, of Hermosa has lived her whole life in Chicago and said she just learned of the Balbo Monument's existence. She was one of the protesters who came out to rally for its removal. "Now that I know, I'm like 'what the hell?'" she said. See Chicago's 1933 World's Fair ... In Color!